In today’s modern world our smartphones can do pretty much anything for us: shoot videos in HD, edit videos, snap pictures, convert images to text, browse the internet… oh yeah, and they can be used for making calls, too. Considering the vast spectrum of functionality that comes with most mobile devices, and the huge amount of available applications, I was surprised that I had trouble finding a good voice commander app. How does Cyberon Voice Commander(EN) fair? Find out more about our App of the Week in today’s review! The app’s name is a good indication of the functionality it provides users with: you can use it to perform voice commands for important functions. Android does provide voice command as a standard function, but certainly not to the same applicable extent as Cyberon. I did a few test runs without using a headset, and let me add that the microphone on the LG Optimus Speed I used isn’t exactly stellar. I was very pleasantly surprised by how well Cyberon detected my voice commands. That said, it would make perfect sense to run Cyberon using a headset—that way you wouldn’t even have to pull your smartphone out of your bag or back pocket in order to make calls. In order to select a contact simply say ‘Call <contact> [at home/work/mobile]’. The app then repeats the contact’s name and selected number and asks you to confirm your choice by saying ‘yes’ or ‘no’. The same thing goes for searching for a contact: say ‘Show <contact>’; you will then be shown a list with names that fit your search criteria. The app’s ability to recognise numbers is astounding. All it takes is a sort of calibrating within the settings and Cyberon is good to go on recognising spoken numbers. I was equally impressed by how well the app handles re-dialing and call backs. The process for starting apps is the same as searching for a contact: just say ‘Start <app name>’ and a list of the most relevant results is displayed. If you don’t select an app Cyberon will start running the most relevant entry. The speaking clock does exactly what you would I expect it to do—no more, no less. The app can be shut down by chirping ‘Good-bye’. Cyberon Voice Commander(EN) doesn’t come with a lot of settings options. You can make a selection of contacts to be included in the search, but unfortunately it isn’t possible to select already existing groups from Google contacts. As a result, the contact list that is created is rather chaotic looking, especially if you have a lot of Google Mail contacts. Similarly, you can select which apps are to be included in a search command. 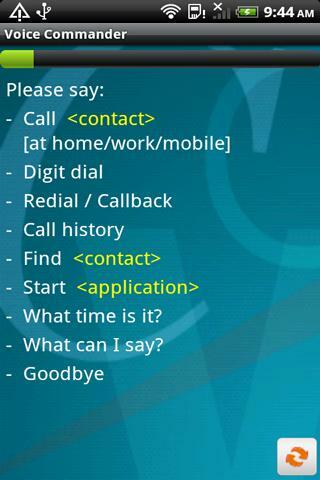 There’s a ‘training’ option that will help familiarise Cyberon with your voice for when you say digits. I recommend taking advantage of this option—the app will perform even better as a result! I would also suggest deactivating the limitation on the length of a given telephone number in the numbers settings. Otherwise Cyberon will only register 3, 10 or 11 digit numbers. The app’s sensitivity can also be regulated. Cyberon Voice Commander(EN) impressed me by how efficiently it recognises voice commands. It’s a great option for users who frequently make use of headsets. It’s very reliable when it comes to dialing, meaning you don’t have to worry about calling the wrong contact by mistake. Cyberon Voice Commander(EN) is set up in a logical manner and it doesn’t take long to get the hang of controls. More information regarding individual commands can be accessed by saying ‘What can I say?’. As for design—my expectations are fairly low when it comes to the design side of voice command apps. A fancy design would seem superfluous. Cyberon Voice Commander(EN) takes a few moments to start up and then runs very well. I’ve been using Cyberon for a few weeks now and it has never crashed. Cyberon Voice Commander(EN) usually costs US$6,71 // EUR5,02 but seeing that it’s our App of the Week it can be downloaded for only US$2,93 // EUR2,19! My pleasure! Glad you both found the review useful, hope the same goes for the app! Quite handy, thanks for the review to let folks know about it.